Each week, I’ll pester one of my creative colleagues with five questions about his or her work. Most of these folks are friends, a few are secret enemies, and one has been blackmailing me for years. 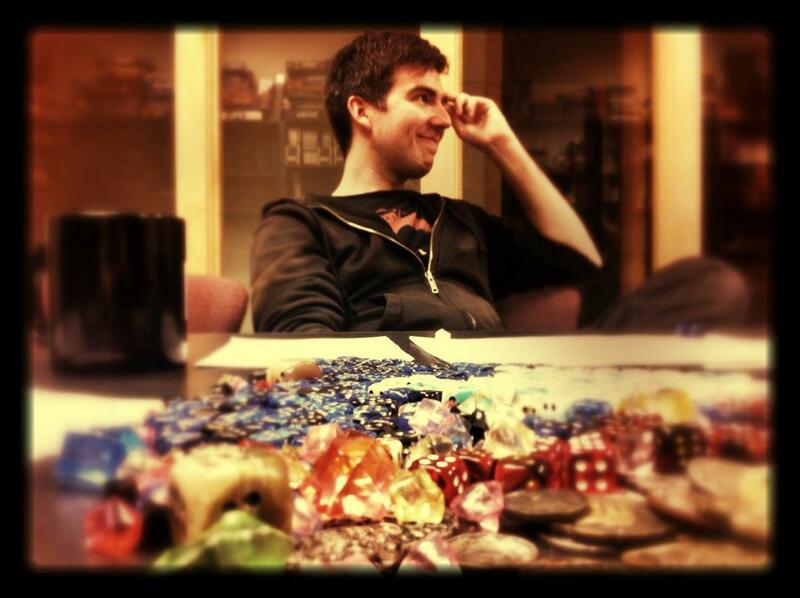 This week’s subject is Wes Schneider, author, game designer, and Editor-in-Chief at Paizo Publishing. When they first joined Paizo Publishing, I didn’t get to know the new guys working on Dragon & Dungeon magazines for a long time. I was too busy with Star Wars Insider and Gamer, and I’d recently gotten a taste for having a life outside the office, so I didn’t linger at the end of the day. Several months after their arrival, I realized I didn’t know anything about the unit I thought of us “Mike-and-Wes” or simply “the new guys.” Finally I asked them out to lunch to get some idea of who they were as individuals. They couldn’t have been more different. While I ended up hanging out with Mike McArtor too, it was Wes Schneider who I discovered shared my love of cocktails and good food, not to mention a good horror movie—but not A Living Hell, for which they still blame me. 1. You’ve developed a certain reputation as the creepy developer over at Paizo, which is quite an accomplishment in a crowd that collectively reveres Lovecraft. What is it that appeals to you about the gothic supernatural? I don’t read fantasy and afterwards believe in dragons. I don’t read sci-fi and believe it’s what the future is going to be. But when I read good horror, I do believe. I objectively understand that there aren’t shadowy things watching me from the closet… but nevertheless, it’s going be a while before I’m going in there. Regardless of whether you call that overactive imagination or garden-variety cowardice, I’ve always enjoyed being scared, being able to indulge in a story and have it continue to affect me even after I’ve put it down. There’s something special, something enviable about an artist creating something that takes an hour to enjoy, but that influences the audience even after they step away. Maybe that’s the definition of trauma, but it’s a sort of consensual trauma that’s addictive to many creatives and their willing audiences. Mindful of that, I love the attention gothic horror and great ghost stories pay to crafting ambiance, to building tension, to manipulating emotions toward a particular response—that’s horror that’s not just going for the momentary scare, that’s horror trying to traumatize. If someone tells me something I wrote made them want to flip on a light switch, well that’s about the highest compliment I can get. 2. You’ve also become one of the prominent voices addressing issues of gender and orientation in gaming. What do authors writing “the other” need to keep in mind when, for example, a man writes a female protagonist (as you do) or a straight person writes gay characters? Avoid stereotypes like the plague. That might be obvious, but it can be more challenging than it seems, especially if you’re not a member of a group and aren’t adept at identifying associated clichés. Recognize your own experience and inexperience. If it turns out that you’re not sure if your “other” feels like a realistic representation, don’t be afraid to ask for feedback from a person from that culture, with those experiences, or with success writing similar characters—preferably another author or creative. If you do ask for notes, though, remember that you’re only getting one individual’s feedback, not the consent or endorsement of an entire group. Tokenism is a real thing, and you’ll never be able to defend instances of insensitivity by saying you got person X’s okay. As writers we should all be striving to get into the heads of our characters, but that’s not something we have to do alone. Talk to your friends, ask if you can have a candid conversation about someone else’s life or challenges, read the accounts of those who speak on related topics, and let yourself be surprised by the experiences and goals of those walking different paths. It won’t make you an honorary member of a social group, but a little direction can set you on a course you might have never previously thought to explore. 3. Fantasy writers often get a reputation for lingering over descriptions of food. Now I know you’re a bit of a foodie, but I haven’t seen this habit in your writing (yet). How do you resist it? Why do you think so many other fantasy writers make food such a prominent aspect of their stories? Ha! You’re right. My usual characters might be a bit malnourished. I’ll have to look into that. But it’s definitely something I’ve seen in my time on Dragon and Pathfinder’s lines. Just as fiction writers indulge sensory descriptions so do adventure writers and world builders. I’ve seen some writers spend paragraphs on an inn’s menu only to practically overlook the murderous cook or the tarry horror lurking in the inn’s basement. Writers write what they know and readers are most affected by what they can empathize with, but I’d encourage all writers to remember their goal and genre. A little description can be a powerful thing, but if you’re having to cut plots or encounters to fully detail every course of the mid-story feast, then maybe you’re not doing your work that much of a favor. 4. You’re kind of the lord of Ustalav, and you run an annual Bastardhall adventure. It’s an open secret that you’re writing a novel set in this land of mists and shadows. What can you (and other authors) add to a gothic setting that hasn’t been done a thousand times before? Or, how can we approach favorite tropes without letting them feel clichéd? Well I guess it’s an open secret now! I’m not going to say too much yet about my Ustalav-based Pathfinder Tales novel, though. That’ll have to wait a couple more months until it’s actually done! Many writers and game designers get themselves into trouble when they try to reinvent the tent poles of a classic genre. In trying to reinvigorate something they end up poisoning it. Readers who like stylish vampires, haunted castles, and curse-spewing witches like those things for what they are and for what they’ve been, not for what they aren’t. There’s strength in drawing upon the pedigree of classic literature and mythology. At the same time, though, if an author pitches me an adventure or story that’s a complete rip off of Dracula or Frankenstein, I’m going to pass. Ultimately, it’s all about new contexts and new situations. I don’t want to see a new take on the lordly vampire or the tortured ghost, I want to see how those classic characters handle situations they’ve never been in before. Like in King’s ’Salem’s Lot, Barlow isn’t a new type of vampire, he’s a classic vampire in a setting we’ve never seen one in before. This leads to a host of new possibilities and terrifying situations. That’s what I’ve tried to do in Ustalav—my gothic-horror-themed corner of the Pathfinder campaign setting—dropping recognizable terror-tropes into a world of heroes and dragons and watching to see how they fare. 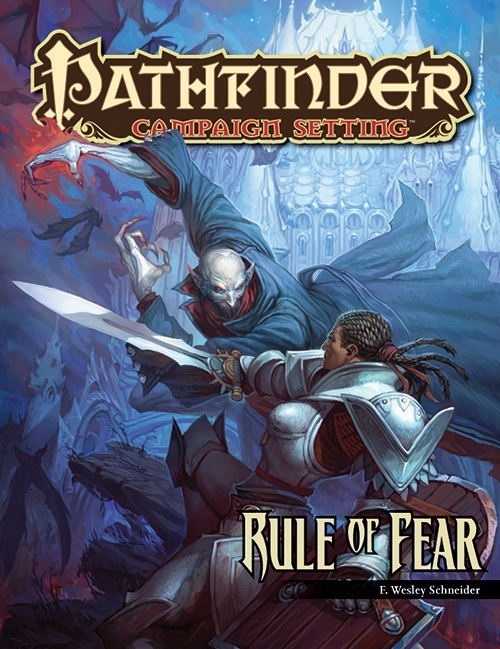 It’s been a fascinating experiment and even after numerous setting guides, the Carrion Crown Adventure Path, and visits by novelists of exceptional taste, it remains one of the most popular—and certainly my favorite—part of the wider Pathfinder world. 5. You had a lot of game developing experience under your belt before your short fiction began appearing at paizo.com. How did it prepare you for prose fiction? And how is it a different task? As a game designer, I cut my teeth working on Dragon and Dungeon magazines, first as a freelancer and later as a staff member. If nothing else, writing for periodicals teaches you two things: the inviolability of deadlines and to always be planning what’s next. The magazines created a fantastically stressful environment, but you either learned how to be creative on a schedule or you cracked. I’ve tried to retain those lessons even in my fiction writing, meaning that I’m a pretty fanatical outliner and scheduler. I’m already pretty dismissive of writer’s block as a concept, but when you’re on a deadline you need to know what you’ve written and where you’re going. So I tend to create ridiculously thorough outlines, which I regularly elaborate on even after I get working. Also, for me keeping to any schedule is about momentum. Aside from forcing myself to write every day, I record how many words I write at every sitting. Not only is it encouraging seeing how even those 500- and 600-word sessions add up, there is nothing more shameful than a day with a big zero staring back at you. Writing fiction is a wildly different world from writing rules and campaign setting descriptions, though. In fiction, the watch words are “show, don’t tell,” but game design is all about “telling.” World building in campaign setting guides and adventures gives you the freedom to spill all of your ideas to the reader, as ultimately they’ll be the ones telling your story. In fiction, there’s not an RPG’s Game Master serving as a middleman. While fiction might not give you the chance to detail every facet of a place or character like you might in a game setting’s analysis, you get to focus more on what’s important, how it’s presented, and how the world works from the inside. Both are a fantastic amount of fun and even though I’ve been angling more toward fiction recently, I certainly won’t be leaving the world of RPG design any time soon. Read more about Wes at his website. This entry was posted in Writing and tagged Paizo, Pathfinder, Pathfinder Tales by Dave Gross. Bookmark the permalink. Thanks for the chance to chat Dave! Always a pleasure. If you can still find them at Scarecrow, check out Kiyoshi Kurosawa’s Eyes of the Spider and Path of the Serpent, two films made in two weeks for crazy small money ($35K sticks in my memory). The result was a pair of surprisingly good revenge thrillers. Thank you both very much. I’m a creative writing major and Pathfinder player and Tales reader and this was insightful and helpful, particularly the idea of not changing the trope, just the situation. I look forward to reading both of your future works(although I have some catching up to do with Dave’s already).